Looking to beat the heat in Indy this summer? Nothing satisfies your quest for a brain freeze quite like a milkshake. From ice cream parlors to pop-up shops, dairy bars, and drive-ins, get your sweet tooth ready for a chilly treat. Choose from fresh berries or rich chocolate, grab a straw, and try a milkshake at one of these five local eateries in Indiana’s capital city. You know you’re in for something epic when you walk in the doors of the famous 96th Street Steakburger. Voted the best milkshake by Indianapolis Monthly in 2004, patrons from all over Indy say it’s a lusciously slurp-able experience. Order up a cookies and cream milkshake for the kids and the world-class strawberry version for yourself. It’s enriched with real strawberries, authentic, hand-dipped ice cream, and fresh, creamy milk. Next time you’ve got a craving for a milkshake, stop by this little blue building and discover a local favorite: Broad Ripple Ice Cream Station. Satisfy your sweet tooth at this quaint parlor, where you can craft a milkshake with any of the shop’s 24 permanent flavors, 12 rotating choices, and a vast selection of syrups. Our favorite flavor at B.R.I.C.S. is the blackberry milkshake, but the pistachio, Georgia peach, black cherry, classic strawberry, and salted caramel are all top picks. Sample the vegan cookies and cream milkshake or the coconut almond fudge that’s a taste sensation when served in a salty pretzel cone. Searching for a premium, hand-scooped dairy treat you can take with you? Visit the Steer-In Diner, an old-school eatery that still features the hard to find blueberry flavored milkshake. Every shake made since the diner first opened its doors in 1960 is lovingly spun with real ice cream and never soft serve. Top it all off with whipped cream and a cherry. This Irvington-based ice cream shop is family-owned and operated. Explore the nearly seven dozen available flavors of super premium ice cream, rotated daily. 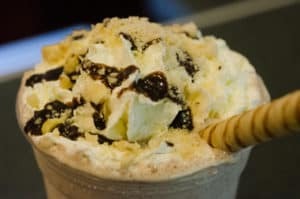 Wyliepalooza Ice Cream Emporium’s mega milkshakes are gussied up with a ton of bonus flavors such as spumoni and green tea. Get your shake on with new levels of decadence with the taro boba milkshake, infused with real tapioca pearls. One of the most popular shakes on the menu, it’s the frozen equivalent of bubble tea. Other top picks include the Heaps of Gold with rich, dark chocolate, caffeinated ice cream, and mounds of Heath candy. Looking for a longtime neighborhood favorite where you can get your milkshake fix? Take a drive over to Graeter’s Ice Cream for a traditionally made shake blended to order with vanilla ice cream and one of 13 homemade toppings. Choose bittersweet, black raspberry or peanut butter from their fountain menu, and then top the whole thing with whipped cream for an indulgent treat. Next time you’re in the mood for some cool family fun, or if you just need to satisfy that sweet craving, order up a milkshake.